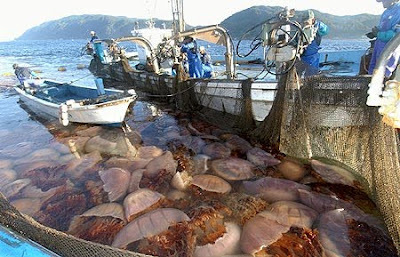 The nomura jellyfish gets over 6 feet in diameter and can reach a weight of over 600 lbs (sounds like an uncle of mine). They are nuisances to Japanese and Korean fisherman (see the last photo). But, most importantly for us, they look like pale bells trailing bundles of viscera. Oh, and one pleasant little note: if hurt or killed they release countless sperm and eggs that settle onto any nearby surface. 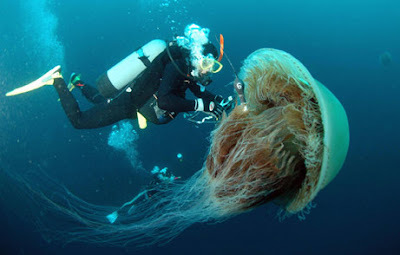 So be careful if you're scuba diving among them -- you don't want to be coated with jellyfish...jelly. Thanks for the photo, Jelo. jellyfish is actually one of my favourite undersea creatures. So beautiful and fascinating. Noooooo! Please tell me these pictures are photoshopped! Nightmare! Why do I keep coming back to this blog?! It feels like one of those accidents that you can't not look at. YIKES! I never swim in a sea again, autch! The bad part about their proliferation is that it took a long time of fisherman adopting the practice of slaughtering them, until they realized that they released their eggs and sperm during death. The fisherman thought they were doing the world a favor in lowering the population, when really they were only contributing to it exponentially! It's almost like a sci-fi movie. Screen is full of giant jellyfish.